I love my warm oatmeal. I do. But sometimes, especially in the summer, I also like to eat oats just plain and well… cold. Not that I can brag about the summer weather we’re having in Denmark. It’s considered a summer day when the temperature rises above 25 degrees Celsius. And for the first time in many, many years, that hasn’t happened once all July. Since I came home from a vacation in Majorca, it’s actually almost only been cloudy and raining. But that doesn’t matter, I can still enjoy my cold oats. Before I went vegan, I used to eat cold oats, too. The only difference was, that back then I didn’t do much out of it. I literally poured oats into a bowl, then topped it with cow’s milk. And I didn’t add anything else. I know that sounds like the worst meal ever, but I’ve always loved the simplicity of food. I started experimenting with my meals, and not just breakfast. I still eat simple meals, but I love how I’ve changed my diet. Eating is much more enjoyable now. 2 things I’ve really been liking with my oats are bananas and dates. I used to sweeten oatmeal with refined sugar, but that’s not healthy at all. Using bananas instead will ensure you a much more nutritious and filling breakfast, plus I find that it sweetens more evenly. When I poured sugar on top, it was only the top that would be sweet. If I mixed it, the sweetness kind of disappeared, and then I would have to add a ton of sugar. It wasn’t really worth it. And dates. Oh, dates. I had never even tried dates before I became vegan. But they truly are nature’s candy. They completely remind me of caramel. When I make warm oatmeal, I normally chop them up and add them to the pot. So good! I added blueberries on top, because I think the sour taste really compliments this recipe’s sweetness. Raspberries, my favorite berries, would be great too! And I know that overnight oats are a big thing right now, and sometimes I make that, too. But I actually like oats better when they’re not soaked. I just find that they have a better, chewy texture. That being said, you could probably mix up all of the ingredients from this recipe in a jar, and let it stay in the fridge for the night, so you have it to-go, if you’d like. Maybe just add a little more liquid. 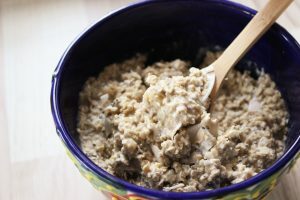 This cold oatmeal recipe does get creamy, though, if you let it sit on the counter for a couple of minutes. Just look at that deliciousness and creaminess! Gotta love chia seeds, and their weird, magical ability to make anything creamy! And of course there’s no other way to eat breakfast than with a nice wooden spoon. Cinnamon, in my opinion, is the ultimate breakfast spice. But I also like to use vanilla powder. 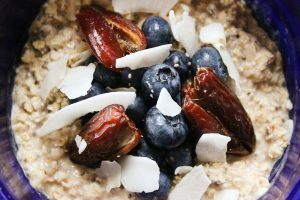 I’m drooling just thinking about when I ate this cold oatmeal… I hope you like this recipe, if you try it. I’ve actually been making it for a while now, but it’s only this morning I decided to take some good photographs of it. 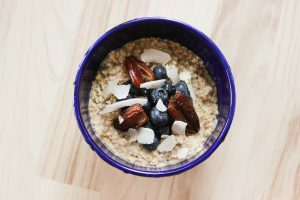 It’s one of my favourite ways to eat oats! Creamy, cinnamon-ery, coconut’ery, cold oatmeal, which is both extremely healthy and filling, plus sweetened completely naturally! 1. Mash the banana in a bowl, you can save a few banana coins for topping, if you’d like. 2. Add the cinnamon (or vanilla powder), maca powder and non-dairy milk to the mashed banana and stir. 3. Pour the oats into the liquid, along with the chia seeds and coconut flakes, and mix it all well. 4. Top with anything you’d like and enjoy!